KUALA LUMPUR (Jan 31): The new Yang di-Pertuan Agong, Al-Sultan Abdullah Ri'ayatuddin Al-Mustafa Billah Shah, arrived to a state welcome today at Parliament Square to the strains of the ‘nafiri’ trumpets played by a 14-member cavalry ceremonial squadron of the Malaysian Army. His Majesty and Raja Permaisuri Agong Tunku Azizah Maimunah Iskandariah Almarhum Sultan Iskandar were welcomed by the Prime Minister, Tun Dr Mahathir Mohamad, and the Deputy Prime Minister, Datuk Seri Dr Wan Azizah Wan Ismail. Sultan Abdullah, accompanied by Dr Mahathir, then walked to the royal platform, past the lance-bearers, to acknowledge the salute of the main guard-of-honour. The central band of the Royal Malay Regiment led by Major Muhamad Nor Azizan Yahya played the national anthem, Negaraku. The royal standard of the Yang di-Pertuan Agong was hoisted and a 21-gun salute was fired. His Majesty then inspected the main guard-of-honour mounted by four officers and 103 men from the 1st Battalion Royal Malay Regiment led by Major Mohd Izham Ahmad Rashidi. The Mufti of the Federal Territory, Datuk Dr Zulkifli Mohamad Al-Bakri, said the ‘doa’ (prayers), the main guard-of-honour performed the salute and the Negaraku was played for the second time. His Majesty then left Parliament Square and proceeded to Istana Negara in Jalan Tuanku Abdul Halim, Bukit Damansara, to take the oath of office and sign the instrument of office as the Yang di-Pertuan Agong. 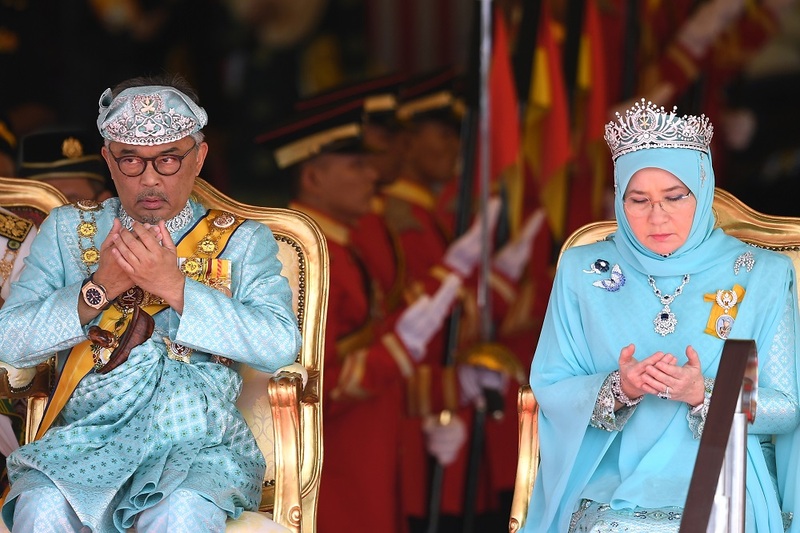 Sultan Abdullah was elected as the 16th Yang di-Pertuan Agong at the 251st (Special) Meeting of the Conference of Rulers at Istana Negara on Jan 24 to reign for a five-year term from today. His Majesty succeeds Sultan Muhammad V, the Sultan of Kelantan, who stepped down as the 15th Yang di-Pertuan Agong on Jan 6 after reigning for just over two years from Dec 13, 2016.